Mega City’s fearless superhero Captain Atomic is transformed into a powerless puppet by his disgruntled sidekick while shaking the hand of his biggest fan, 12-year old Joey Felt. When Captain Atomic realizes the ONLY way to access his former powers is to join up with Joey, it is simultaneously the worst thing that could happen to a superhero, and the best thing that could happen to a 12-year old boy. Together, the two form an awkward and comedic partnership as Mega City’s newest superhero, Atomic Puppet. When Naughty Kitty captures Captain Atomic, Joey has to quickly come up with a plan to get him back. 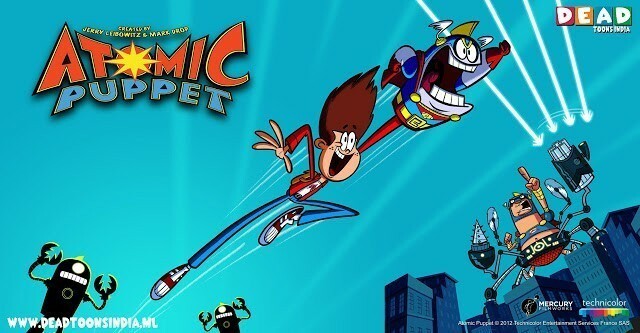 But will Joey be able to save Atomic without the help of his superpower puppet? When Joey gets detention, he and Captain Atomic attempt to get his teacher back. When Captain Atomic gets stuck in a pickle jar, Joey tries all sorts of ways to get him out!